WWI and WWII HORNS UP!! THE NAVIGATION TOOL TO THE HISTORICAL PAGES ON THIS WEB SITE ARE AT THE TOP OF THIS SCREEN. THE SITES ARE "TLSN", "SPORTS", "GUEST WRITERS", "MISSIONS", "ARTICLES" , "LOST TOO SOON", AND "SENTRY". The KXAN.com story follows. The two photos and one quote were added by Billy Dale. The connection between father and son is a bond greater than most. Throughout his football career, former Longhorn linebacker Dusty Renfro has relied on his dad. 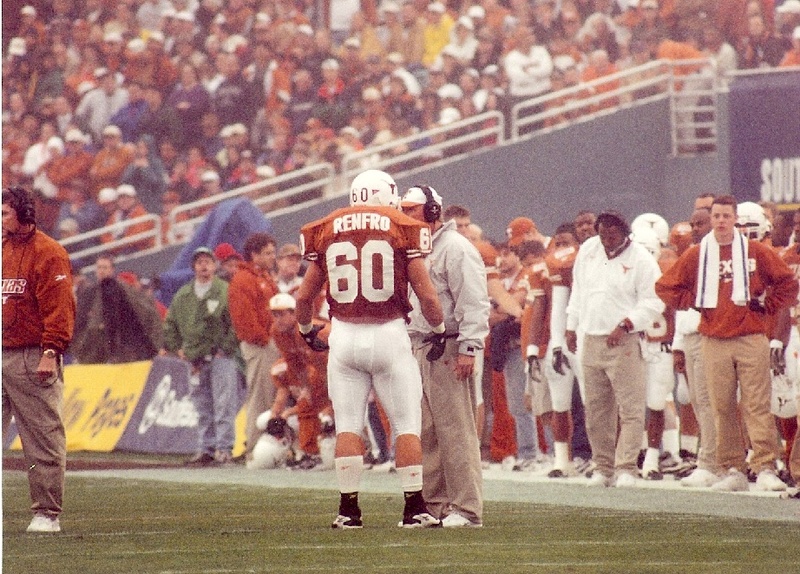 Renfro played for the Longhorns from 1995 to 1998, leading Texas in tackles in his junior season. During this holiday season, Renfro gave his dad a priceless gift. He gave him a future. On a house boat in Lago Vista, Dusty Renfro ditched traffic for Lake Travis. In some ways, a return to the quiet calm of his childhood. Renfro and his entire family moved back to Austin two years ago searching for a renewed way of life. For Renfro’s dad, Terry, it was a necessary pursuit. “It was a family effort to get him into shape,” Dusty Renfro said. “I knew that if I was working out with him we’d get it done because you tend to procrastinate when you do it by yourself. I needed that motivation,” Terry Renfro said. In bad health, Terry Renfro needed a change. He needed a workout partner and no one fit the bill better than his Longhorn linebacking son. “Every time I’ll say that’s enough well he’ll start giving me those little one-liners that Maddog (Jeff Madden) used to give him. I’ve just always told my son that they could accomplish anything they set their mind to and so it wasn’t going to be fitting to teach them that as little boys and then me as an adult not follow through with it,” Terry Renfro said. Working out flat out worked. The Renfro father and son helping each other. In three years, Terry Renfro lost a significant 113 pounds. The significant purpose came with it. The goal– find a kidney transplant. That’s when fate and family stepped in. “We’re going to get you in shape and I’m going to give you a kidney,” Dusty Renfro said. Though the intentions were clear, challenges remained for Dusty’s ultimate gift to his dad. Terry Renfro needed to lose weight for a transplant. Dusty needed to shed some of his own to donate. It didn’t even include a father grappling with a son’s sacrifice. With a talk between father and son, a future was extended throughout the Renfro tree. “I had a talk with my sons and I said look, this is the right thing to do. I just told them…we are supposed to give until it hurts,” Dusty Renfro said. The Renfro’s underwent successful surgery in early December. Dusty giving of himself for his dad. As for their workout plan– it’s still intact just with a break for recovery. “He’ll go oh man, that hurts so bad…I’ll go no, you know what hurts? Having a kidney removed that’s what hurts,” Dusty Renfro said. “The guilt deal he puts guilt on me. He also said that he never has to buy me a birthday or Christmas gift…that he’s paid up. I agreed to accept that,” Terry Renfro said. During a holiday based on giving, this is one gift beyond value. 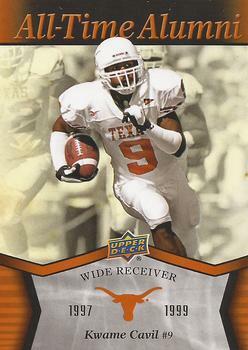 Kwame Cavil played wide receiver at Texas from 1997-99. He played in 33 career games, including the 1999 Cotton Bowl and set UT and Big 12 single-season records for receptions (100) and receiving yards (1,188) in 1999. He ranked third on the UT career charts in receptions (174) and fourth in receiving yardage (2,279) at the end of his career. Cavil started the final 27 games of his career and caught at least one pass in 29 of his final 30 games, including his final 21 contests. He teamed with Major Applewhite to become one of the most productive QB-WR duos on UT record (144 completions/1,727 yards). 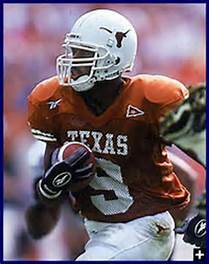 He was a 1999 second-team All-American (Associated Press), 1999 first-team All-Big 12, 1999 UT Darrell K Royal Most Valuable Player) and 1999 UT Most Outstanding Wide Receiver. He posted a UT freshman record of 23 receptions for 316 yards (ranked No. 2 on the UT all-time freshman list) in 1997. He signed as a free agent with the Buffalo Bills following the 2000 NFL Draft and played one season in Buffalo. Cavil then played five seasons in the Canadian Football League with Montreal, Edmonton, Winnipeg and Hamilton. Cavil spoke to MB-TF.com during Letterman's Weekend. How are you enjoying your time here at letterman's weekend? I was always ready to come back and make a fellowship with the guys. Just bringing up old stories and creating new ones on the golf course, people lying on their golf scores. So it is a great deal and I love to come out here and see the guys that I don't see all the time. Once you leave here, you are back to the regular swing of things. So coming out here and getting the chance to see these guys is always a great thing. What you are doing now? Currently, I am at Manor High School teaching speech communications, and I am the DB coach. I am just fulfilling my life long dreams of helping kids and watching them be successful. I come from a family of teachers so I love it. It is a great deal and every year it is something different. Tell us about your experience playing in the CFL. It was tremendous. I got the chance to be successful and won two Grey Cups. I got the chance to play for a long time, and I enjoyed it. It was cold being from Texas where it is always warm, but I enjoyed myself. [I] had a great time up there, had the chance to be a champion, and it is always good to come back and tell the guys how good it is up there. What was it like to experience a little bit of the world? It was beautiful. What's funny is that when you are good to the game, the game is good back to you. The game was taking me to a lot of places, being able to travel the world and see a lot of new things. I tribute all of that to hard work and dedication. This game of football has now been able to bring us all back together right here in [south Austin.] So it is always good to go out and see other things and get more culturally diverse and bring it back to the states. To be here with the young ones, when they get old enough, and then you get to tell them you actually did something. How did attending UT prepare you for your career? Just coming in and being part of a tremendous coaching experience as far as the things Mack Brown permeates through his program. Just the family atmosphere at the University of Texas and going back and seeing that is just a wonderful thing and to see that with all the things you are able to do. Has seeing James Brown and Ricky Williams brought back a flood of memories? The reason why you come back is to tell new stories and relive some old stories that you guys did on the field. It's like a big ol' family. It's just like coming back to family and seeing where everybody is at now and catch up. It is a good thing, and I do it every year. What are your thoughts about being in that select group of great Texas wide receivers? It is a tradition. Before I got here, it was Mike Adams and Eric Metcalf and people like that that set the tone and standard here at the University of Texas. So what we are just trying to do, at each position, is carry on the legacy and pass the torch on to the younger guys and have them follow in the footsteps that we set for them. Hopefully they can live up to it and be a great success. Like you said, Quan Cosby, Jordan Shipley and his little brother [Jaxon], the tradition just goes on and on. There will probably be someone after him, so it is just about the level of excellence that you set, and I want all of them to live up to it and continue the tradition. Ricky Brown moved into his current role as Assistant Athletics Director for the T-Association in January 2016. In his new position, Brown focuses on enhancing engagement and mentoring programs for letterwinners. He joined the T-Association after spending the past three years as Assistant Athletics Director for Leadership Giving in the Longhorn Foundation, where he oversaw fundraising activities for capital projects and endowments. Brown is a football letterwinner from Texas who earned his undergraduate communications degree from UT. He later received his MBA from SMU. Brown grew up in Arlington, Texas, and in his free time enjoys cycling, fishing and hunting. The work never stops on a ranch. Just ask Texas Longhorns star defensive end Tony Brackens, who spent the team's off weekend at his family's farm in East Texas herding cattle into a pasture for winter feeding. While his teammates were relaxing, watching other teams play on TV and challenging each other to video games, Brackens was on horseback, rounding up 150 cows and seven bulls into trailers. And that's nothing for the junior from Fairfield, who found time during prolific high school basketball and football careers to make a little extra money in local rodeo competitions. He no longer has to get up early to bale hay, break a horse or rope an errant calf. These days, Brackens just has to go to football practice and take on 300-pound offensive linemen on Saturdays. "It's easier. Here, I have a time limit. When the whistle sounds or the buzzer goes off, I'm done," said Brackens, who began driving tractors when he was 8. "When I was at home this weekend, I didn't finish until 9:30 at night. When you're doing ranch work, you finish whenever you get finished." Pro scouts already are likening the 6-foot-4, 250-pound Brackens to Dallas Cowboys defensive end Charles Haley. Brackens uses quickness, leverage and uncanny instincts to consistently make his way to opposing quarterbacks. As a true freshman, Brackens had 10 sacks while earning Southwest Conference Defensive Newcomer of the Year honors. Last year, he repeated as a first team All-SWC selection, leading Texas in sacks (7), tackles for loss (10) and quarterback pressures (30) while becoming the focus of double teams. A hairline fracture in his left leg kept him out of 3 1/2 games this season, but in his first game back against Oklahoma, he had two sacks, three pass breakups, two quarterback pressures, two other tackles for loss and blocked a field goal attempt. "Tony forces teams to change their offensive scheme," said Texas coach John Mackovic. "He constantly draws double teams and still has success. You'll catch some guys resting on a play now and then. Tony never rests." He was, as usual, quiet about the whole thing. Tony Brackens told no one because, really, who needed to know? The public? What did they care about him? Not as a football player, but him, the person. The University of Texas? No, no one there need know, because that would mean someone else finding out, then the media, then . . .
Aaarghh. He didn't need it. So in spring 1995, when he began volunteering for Child Protective Services in Austin, a group that works with displaced children from abusive homes, he told no one. Which worked. For a while. Until he brought the five-year-old boy he adopted in the program to practice. "He was devastated when I found out," John Bianco, Texas' sports media relations director, said, "because he knew I'd probably tell everyone, which I did." "He wound up winning a Good Works award from the College Football Association and getting a lot of good publicity," Bianco said, adding with a laugh, "Tony may not ever have really forgiven me for that." Who is Tony Brackens? Really? Those who know him best believe the above story as good a glimpse as any into one of the more un-glimpsable players on the Jaguars. He is more than a Pro Bowl defensive end, more than the guy who spent the summer making big demands and bigger headlines, but what, exactly, that something more is is difficult to define. On the field, he's phenomenal at times; inconsistent at others. Off the field, he is just as enigmatic. Some teammates call him a valued friend; others say he's difficult to know. Publicly, he is aloof, intimidating, a mystery, but those who know him best say to remember one thing about his elusive image. He wouldn't want it any other way. "He's a private person," said Brackens' head coach at Texas, John Mackovic. "That's just how Tony is, and once you realize that, you understand him." Suspicion was normal researching this story. Brackens, 24, has been media-wary since being drafted in the second round in 1996, agreeing to interviews only occasionally, and rarely letting questions stray from football. This off-season, he declined all public comment after the Jaguars made him their franchise player in free agency, limiting his ability to sign elsewhere. He declined interviews for this story through his agent. Some close to him rallied around his anti-media stance. A telephone phone call to Brackens' coach at Fairfield (Texas) High School, Randy Angel, resulted in a message through a receptionist, "If Tony's not talking to the media, I'm not, either." The receptionist said Brackens was a "great kid in high school." "He was my assistant, in a free period," she said cheerfully. Asked her name, and if she would like to talk about Brackens, she said, "Oh, no, no. I can't do that to Tony." Brackens' father, Tony Brackens, Sr. did agree to be interviewed, and said his son's reluctance to speak, even before this summer, often has been misunderstood. Brackens, Sr., is, by nature, outgoing. He has been involved in local politics in Fairfield much of the last two decades, and was mayor from 1993-95. "Tony's not that way," Brackens, Sr., said. "He's like me in a lot of ways, in that he'd rather do something than talk about. As mayor, I'd get a road worked on, or something built, and that's what I liked about the job. As a football player, he likes the 'doing' part. "I can get up and talk a little bit. With Tony, talking to a group, it's just one of his drawbacks. Everybody's got something they don't do real well. That's Tony's. Speak to him, he'll talk back, but he doesn't like crowds, really, and he especially doesn't like talking to them."